Economic turmoil is front page news in recent months, headlined by falling stock prices. Given financial market trends, coupled with declining industrial production and a clearly weakened manufacturing sector, many are wondering if the next recession is just around the corner. The answer is a strong “probably not,” even as the prospect cannot be ruled out completely. The reason is twofold. First, the vast majority of non-manufacturing measures and indicators remain clearly in expansion territory. In particular, strong job gains are now being followed by accelerating wage growth. Second, the manufacturing weakness so far remains confined to energy, mining and related sectors like metals and the states that reply upon such industries. Certainly the overall decline in industrial production is concerning, however there is yet to be widespread pain, which is typically seen in recessions. 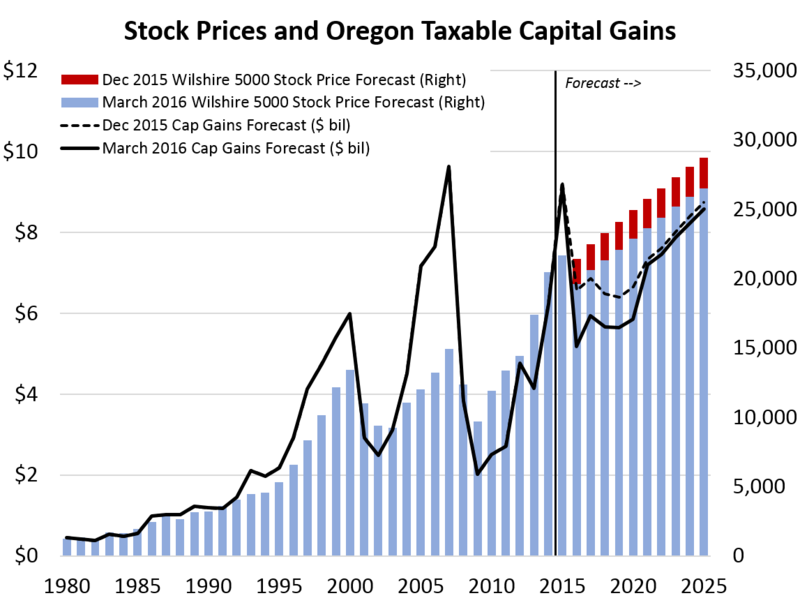 Oregon continues to see full-throttle rates of growth. Job gains are outpacing the typical state, as are wages for Oregon workers. The state’s average wage today, while still lower than the nation’s, is at its highest relative point since the mills closed in the early 1980s. Furthermore, these wage increases are not confined to certain industries or regions of the state. Rather, wage gains are seen statewide and across all major industries. Encouragingly, Oregon’s improving economy is pulling workers into the labor market, as the participation rate is increasing off its recessionary lows. While much of the decline in labor force participation is demographic, some is certainly attributable to the business cycle and job opportunities. Overall, much of Oregon’s advantage in expansion, vis-à-vis the nation, is attributable to the state’s industrial structure and net migration flows. Heading into the peak season for income tax collections, Oregon’s General Fund revenues are posting healthy growth. In keeping with a strong labor market, personal income tax collections are expanding at nearly a double-digit annual rate. While revenue growth has been strong thus far in the biennium, these gains have not come as a surprise. Expectations for growth in Oregon’s General Fund revenues have remained virtually unchanged since the 2015-17 budget was drafted. In addition to healthy General Fund revenue growth, Oregon Lottery sales have been very strong as well. Recent collections have consistently come in above expectations. Although General Fund revenues have been tracking very close to expectations to date, sharp recent declines in equity prices and corporate profits have led to a reduction in the revenue forecast going forward. 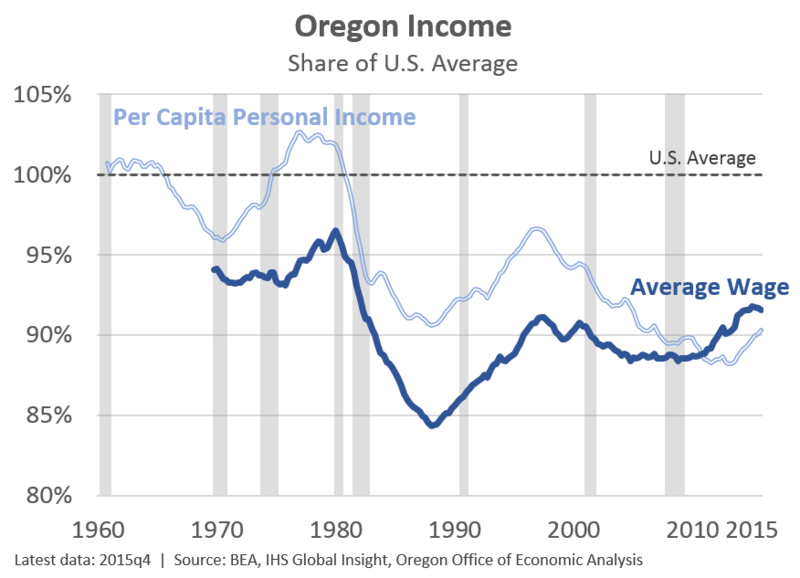 In particular, Oregon’s budget depends heavily on personal income tax collections tied to realizations of capital gains and taxable dividends. These collections are extremely volatile, with revenues subject to the sometimes unpredictable behavior of investors. Equity markets took a step backward soon after monetary policymakers began to raise interest rates this winter. The full negative impact of stock price declines on personal income tax collections will take time to be realized. During a sell-off, the volume of trade increases, and paper gains from past years become subject to tax. Afterward, taxable capital gains face considerable downward pressure, with paper earnings from past years having been tapped, and with losses being carried forward into future tax years. At the level of price declines we have seen thus far (around 10% at the time of production), much of the pain will be felt during the 2017-19 biennium and beyond. For now, many investors are still taking in some profit when pulling their assets out. If prices decline further, income losses will become more significant. Taxable capital gains will be further supported in 2016 by realizations related to one-time events including the sale of many large local businesses. last time i looked at 2014′ median household income for Eugene/Springfield area it was 45000$ what do you think 2015′ median income is?? It’s hard to like your stuff, altho I do. Wow, that came out wrong on my part. I meant, use the ‘like’ function on this site.